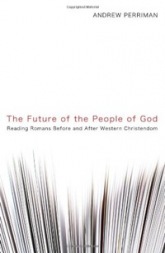 About six week’s ago, Andrew Perriman (link to his blog) passed along a free copy of his newest work, The Future of the People of God: Reading Romans Before and After Western Christendom. As promised, I now want to post my review of the book. It is rather lengthy, with some extended quotes. But I have done so to give people a better understanding of some of his thoughts. Perriman comes through with a thought-provoking and deeply biblical, historical and theological treatise, supporting his work from the Greek of the New Testament and Septuagint (Greek Old Testament), as well as plenty of references to deutero-canonical texts and other such second temple period works. It’s hard to imagine such an academic work could be laid out in a shorter textual framework, but I’ve seen it done before and Perriman has joined that club. Many will be aware of the discussions revolving around the new Pauline perspective, especially in its more current rounds of debate between John Piper and N.T. Wright. I will say from the outset that, if people struggle with accepting the new Pauline perspective on justification and other theological terminology embedded in Romans, then I believe those same people will struggle even more with Perriman’s work. Yet, I do believe this work should be considered a worthy voice in the evangelical scholarly world on Pauline studies and, particularly, studies in Romans. Like I said, this is a great challenge to the western, reformed tradition of which most, if not all, of evangelicalism falls under (including myself). And its voice summons us to rethink Paul and Romans beyond even the new Pauline perspective. The first point made is that Paul relied heavily on the words of Habakkuk in his framework for Romans. Thus, we need to grasp the complete message of the prophet, Habakkuk. In Rom 1:17, we are all aware of Paul’s specific quotation of the second part of Hab 2:4 – ‘The righteous shall live by faith,’ alternatively translated as, ‘The righteous shall live by their faithfulness.’ But Perriman makes quite clear that much more is going on here than a quoting of a few words from Habakkuk. But what does this mean practically? Perriman, then, challenges that the ‘salvation’ offered ‘to the Jew first and also to the Greek’ is not so much about humans being assured of a personal salvation from sin, but rather deliverance from the specific wrath that will come within a particular context in history. But this ‘day of wrath when God’s righteous judgment will be revealed’ (Rom 2:5) does not speak of a last and final judgment like what we see described in John’s final apocalyptic vision in Revelation. Rather, Paul’s is a reference to an actual event that is to come in history. So, for the Jews, that day of wrath culminated in the historical event of the destruction of Jerusalem and the temple in AD 70, and for the pagan Greeks, this judgment-wrath came with the defeat of their gods by the one true God and Father of our Lord Jesus Christ, which was expressed in the Christianization of the Roman empire by the earlier part of the fourth century (hold on to this statement for a moment, as I will come back to it). Perriman acknowledges that identifying the setting up of ‘Christendom’ within the Roman empire during the early 4th century as the fulfillment of Paul’s words of judgment pronounced on the oikoumenē can feel very problematic. Many have debated (and will continue to debate) both whether such an act by Constantine should have ever been sanctioned and the authenticity of such. But, regardless, Perriman sees both of these events (the war of AD 67-70 and the setting up of Christendom in the Roman empire) as the actual, historical outworking of God’s judgment that would come on the Jews first and the Greeks as well. And it is those who stand on the faithfulness of Jesus Christ who were to be delivered from the wrath to come, to the Jew first in AD 70 and eventually to the Greek. Thus, God was vindicated and shown as righteous through these acts of judgment. When it comes to defining both the righteousness of God and justification, Perriman’s descriptions are not that far off from the new Pauline perspective. This is an argument that I cannot imagine a whole host of evangelicals accepting. I have tried to read Romans 5 apart from an evangelical, Augustinian perspective and it is amazingly difficult. Such a view is set deep within me (and most of us). But, rather than ‘over-universalizing’ the text of Romans 5, we are confronted with the reality of whether Paul was speaking to the church throughout all ages or to the specific Roman church context. I think we can easily guess to whom Perriman believes Paul was speaking. Since I cannot mention every point Perriman makes in the book, I’ll move on to his discussion revolving around Romans 8 and the renewal of creation. Here, as many would agree, the resurrection of Jesus Christ actually began the new creation, which means that not only are we, as God’s people, to look forward to a resurrection ourselves, but to the renewal of the whole creation. Interestingly enough, I felt Perriman took more of a middle-ground on Rom 8:19-23. And, so, Perriman believes Paul is telling a two-stage story relevant to the revealing of the glorious sons of God in the midst of suffering and death during the near wrath to come, but also speaking of a full liberation of creation from decay. With regards to the theme of chapters 9-11 and the summary statement of Paul’s that all Israel will be saved (Rom 11:26), Perriman discusses this in his chapter 11. One point he takes time to emphasize is that the salvation of all Israel could not come until after the pronounced judgment had first come. Remember, judgment on the Jew first, then the Greek. But judgment had to come before salvation would come to all Israel. Thus, why we never saw the great grafting of Jews back into the olive tree and the salvation of all Israel. And so, the subtitle of the book, Reading Romans Before and After Western Christendom, makes sense. We are quite used to approaching the text with many centuries of theological discourse layered over top, which can end up servering the text from its historical narrative. Hence, Perriman’s thesis that we not over-universalize the text, but rather read it as if it was penned before Christendom, which it was. And, not only that, as we do so, these words of Paul will give us insight into how we can read the text going forward today following the judgment upon and collapse of what was western Christendom, especially that which was deeply rooted in western Europe in decades foregone. I will have to say that I do appreciate Perriman’s attempt to remind us to read Romans as a first-century text written to a particular church in a particular historical setting. As I said with Romans 5, it is a difficult task to read the text without all the layers of reformed theology that is part of our history. It’s not that we should simply chuck out our history, for we have come from somewhere. But, just as proponents of the new Pauline perspective remind us to understand the text within its historical setting and framework, so does Andrew Perriman in his book, The Future of the People of God. 1. If Romans is not such a ‘universal’ text as we suppose, where do we turn in Scripture to understand and formulate a more universal anthropology, hamartiology (sin), and soteriology? Is it Ephesians and Galatians? Or can we also stick with Romans as a text that speaks to the situation of the whole of humanity? 2. With the two-stage perspective on Rom 8, can we not look to do this with the entire text – allow it to speak into their situation, but also allow it to speak into the overall, universal context? 3. With Rom 11:26, it seems that Paul is making a very matter of fact statement of what will take place – all Israel will be saved. It’s not a specific prophetic utterance, but something that he seems assured of in his apostolic authority. So, what would you do with someone who argued this? – Yes, Israel’s grafting back in is contingent upon faith(fulness). But Paul seems to claim such as inevitable at some point in the future. 4. I would love to see Perriman take this approach with other writings of Paul and the New Testament, say Galatians and Ephesians, two major treatises of Paul. Would he take this same approach in deconstructing some of our inherited theology and look to read the text in its own specific historical setting? I suppose so with something like Galatians, since that is what the new Pauline perspective has done. For those interested in Perriman’s more complete work on eschatology, I would suggest reading through his The Coming of the Son of Man: New Testament Eschatology for an Emerging Church. It’s sitting by my bed to read soon. This entry was tagged book reviews, books, justification, new Pauline perspective, Paul, Romans. Bookmark the permalink. Thanks for this solid stuff. I noticed one quote from N.T. Wright. Did he interact a lot with Wright, Dunn, and Sanders throughout? Sure has given much to think about. I do accept his call to consider the larger context of Habakkuk and the eschatological import of justification. But yes, I too have find his rereading of Romans 5 problematic for the time being. I do find his reference to AD 66-70 in relation to what Paul says in Romans quite intriguing. All have to follow up on this matter. Good stuff! He did interact with Wright and Dunn a lot, as well as Witherington and Hyatt’s commentary, and Moo’s commentary. But not with Sanders. I need to re-read the whole section on Romans 5 in his book and then read Romans 5. But I’m telling you, it is hard to lay aside our evangelical, reformed, Augustinian presuppositions. I should mention it in the article, but it would be good to also read his book, The Coming of the Son of Man: New Testament Eschatology for an Emerging Church, which is his major eschatological treatise. I have it on my nightstand to read soon. Scott: The Paternoster 2006 edition of The Coming of the Son of Man has 240 pages, whereas the Wipf & Stock 2012 edition (reprint?) has 282 pages. Do you know if they’re identical? I called Wipf and Stock and the lady said they got the e-file from Paternoster so the text is the same. She said Paternoster only counts numbered pages and there may also be formatting differences. What do you really know about what happened way back then? Or about anything at all for that matter? Why/how are the writings of an ancient power-seeking tribalistic cult binding on all of humankind in 2010. We live in a time when all of the Sacred Texts of the entire Great Tradition of humankind are freely available to anyone with an internet connection. And all of the histories of the various Traditions too, especially in the context of your website, all the horrors perpetrated by Christian true believers. Plus there are four billion living-breathing-feeling human beings that do not subscribe to your power and control seeking cultic “God”-idea. What is commonly recognized, defended and promoted as religion in our Age is only the most superficial and factional and most often dim-witted and perverse expressions of ancient national and tribal cultism. What is more the two power and control seeking, and would be world-conquering, political cults of Christian-ism and Islam-ism are now engaged in global warfare for the “final showdown”. If this global warfare is allowed to run its seemingly inexorable course then the human world, and indeed the entire Earth-world will be destroyed. All religions, without exception, are power and control seeking cults. Thanks for stopping by, though I am not sure how you found my blog. I am a bit confused at how your comments specifically look to interact with my article. You asked: What do you really know about what happened way back then? Or about anything at all for that matter? Actually, there are quite a number of historical resources available, at least with regards to the Judaic-Christian faith, all coming out of what is known as the ‘second temple period’. And, though some don’t want to admit, the Bible is an historical account. I am sorry that you feel this way towards God or faith. No doubt Christians have messed up and done wrong, which includes me. But that is why I am glad that, ultimately, this is not all determinate on the activity of an all-good God. I want to get my hands on a copy! Amazon.com. 🙂 But it is a little expensive there. It’s a couple of bucks more at Wipf & Stock’s website, which is weird because they are the publisher.